Our son, Brendan was driving my wife, Therese and me from Limerick to Galway, and we had some time to spare that we thought we might use to take in a place of historic interest. We left the road at Bunratty, ignoring, without much effort, the hundreds of visitors trying to entice us into the castle, and the almost as many who packed the adjacent Durty Nellie’s pub. These are among the most famous visitor attractions in Ireland, and almost obligatory for anyone coming to the region of the Shannon estuary. We followed the signs along narrow roads that twisted through the tiny hamlets of Sixmilebridge, Annagore Bridge and Kilmurry, to arrive, quite suddenly, at a fairly large car park containing three cars and two coaches. Several dozen teenagers from three schools in Milan had just disembarked from the coaches. They appeared, however, and subsequently proved to be a well-behaved group, and did not take anything from what turned out to be a remarkably interesting and enjoyable visit. The first place we arrived at on our circular walk was the castle, a fortified tower house, built in 1550 by John MacSioda MacNamara. A century after its construction, it had lost its roof, and was largely in ruins. Repairs were begun in the 1820s, by Tom Steele, a colleague of Daniel O’Connell. 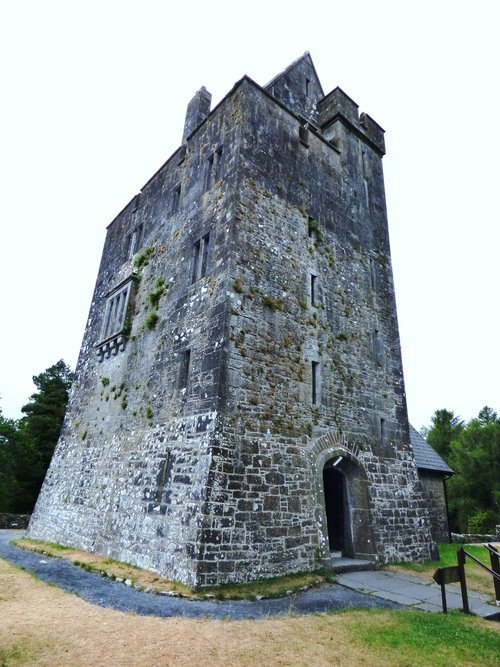 It again fell into ruin, and final repairs were not completed until the castle and its lands were acquired in 1965 by mediaeval art expert, John Hunt (1900-1976), whose plan was to recreate many features of the Bronze Age and Early Christian life of Ireland. The ground floor contains an exhibition of objects from the pre-historic and mediaeval eras, together with photographs depicting the opening of the centre. Spiral stairs lead up to higher floors and eventually to the roof, around which a narrow walkway gives extensive views over the surrounding countryside. 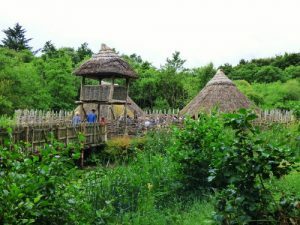 We caught up with the teenagers at the Crannog, which jutted out into what, in pre-historic, and indeed normal times, would have been a lake, but the prolonged dry weather had removed all but the last traces of the pool. While the students listened to tales of life within the structure, we were able to examine the wood-wattle-and-thatch houses that filled the circular stockade. Crannogs were a feature of the Iron Age fringes of Celtic Britain, but being almost entirely wooden in construction, have rotted away, leaving only foundations hidden beneath lake surfaces in Ireland, Wales and Scotland. They were artificial islands, surrounded by wooden fencings and reached by a causeway, and provided some defence for the circular dwellings and domesticated animals within the compound. Following on from the Crannog, the footpath passed an Iron Age field, in which early varieties of wheat, barley, peas and beans were grown, to enhance a diet supplemented by hunting and gathering. Then came a few metres of wooden road, dating from the same period, which was part of a bog track that was discovered in Co. Longford in 1985. 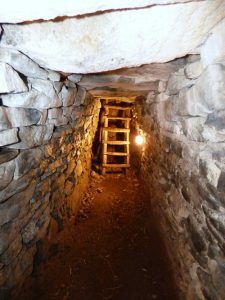 Passing a circular hunters’ cooking site, bounded by a low wall, a solitary standing stone, marked with mysterious Ogham markings, and a portal tomb, we arrived at a reconstructed ring fort. The remains of many thousands of these exist throughout Ireland, and indeed elsewhere in the British Isles. 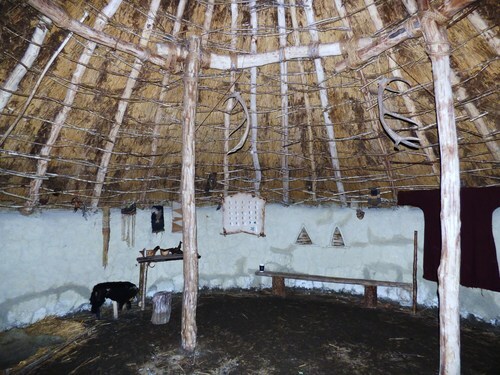 Like the Crannogs, they enclosed homes, farmyards and areas in which food was cooked, grain ground and pottery items created. 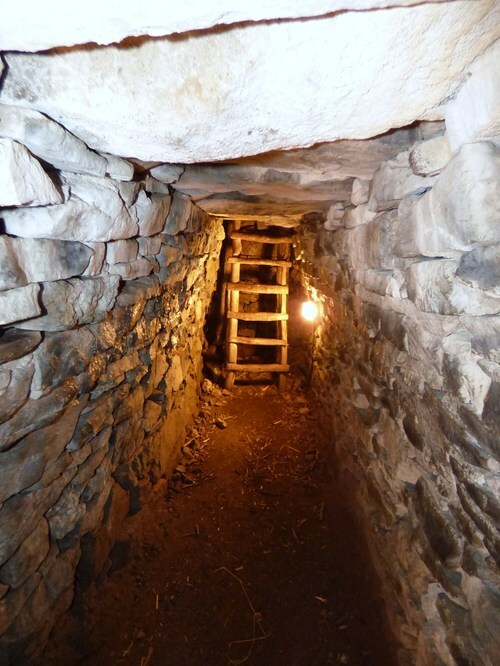 Leading into the ring fort, through a dark tunnel and up a wooden ladder, was a souterrain, an underground passage in which food was stored at a constant temperature of around 4C, the early Christian era equivalent of a fridge. A short uphill stretch brought us to a glass house which, at first sight appeared out of place. On entering, however, we were greeted by The Brendan, the actual boat in which explorer, Tim Severin crossed the Atlantic in 1976. 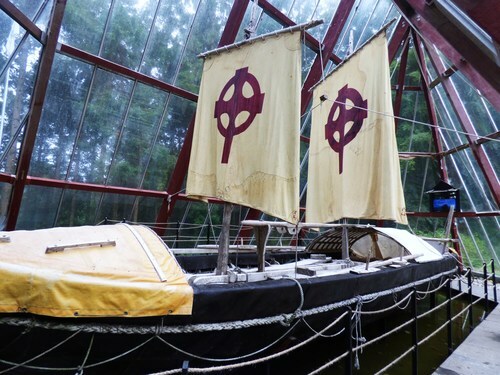 The Brendan Voyage, as Severin’s trip was called, was an attempt to determine whether the legendary crossing of the ocean by the 6th century St Brendan, in a wooden vessel covered with oak-tanned animal hides, was possible. St Brendan’s account of his voyage is extremely convincing, and though Severin’s expedition does not prove its certainty, if it is true, then this early Christian saint reached America many centuries before the more authenticated journeys of Lief Ericsson and Christopher Columbus. My son, Brendan, was only an infant at the time of Tim Severin’s voyage, but he has always been fascinated by the possible adventures of his eponymous saint, and Shaun Davey’s evocative symphonic suite inspired by them. Seeing the boat was therefore one of the highlights of his entire Irish trip. But our short walk was not yet finished. 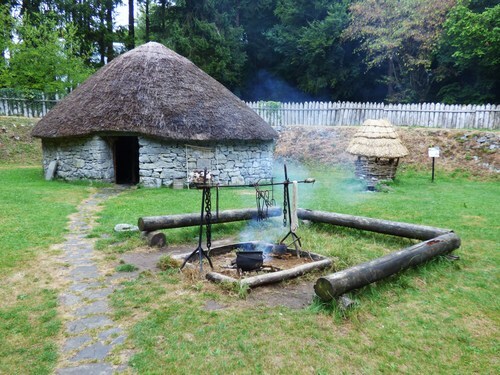 The whole site lay within a quiet woodland of tall trees and dense understorey that gave the experience a feeling of authenticity that, while not entirely absent, was less pervasive in the more manicured and much more crowded Bunratty. Before returning to enjoy some light refreshments in the café of the small visitor centre, we passed a final touch of realism, an enclosure in which three wild boar lay peacefully asleep.